George Jones and Tammy Wynette created great country music together despite their tumultuous marriage and eventual divorce. 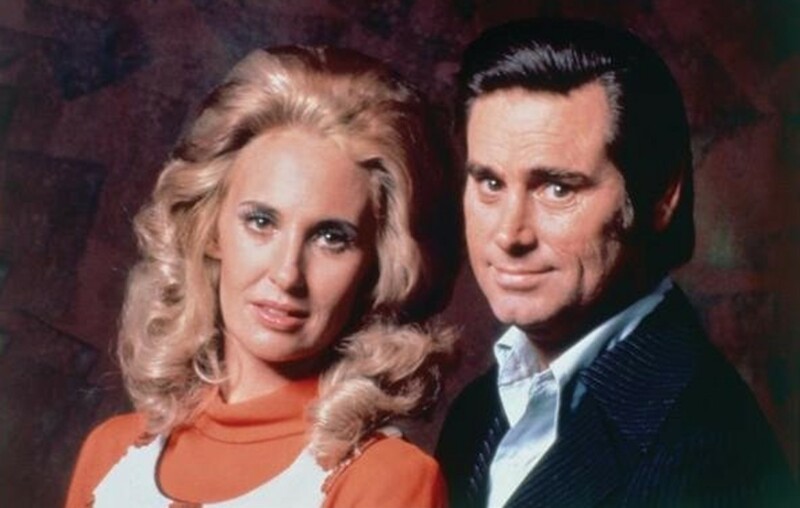 Country music icons Tammy Wynette (May 5, 1942 – April 6, 1998) and George Jones (September 12, 1931 – April 26, 2013) didn’t have the best track record when it came to marriage. Jones had been married twice before he married Wynette in 1969. After the famous pair divorced he married one more time. Wynette had been married two times before marrying Jones, and married two more times after their divorce. During their time together they became known as “Mr. and Mrs. Country Music” and their union remains legendary. George Glenn Jones married Virginia Wynette Pugh on February 16, 1969. They became Country Music Royalty and produced many hits together including “We’re Gonna Hold On” and “Golden Ring”. At the beginning things were good. Each had a history of failed marriages, but that wasn’t going to keep them from trying to find happiness together. In 1970, their daughter, Tamala Georgette, was born. What was supposed to be a happy time, soon became chaotic as Jones was committed to a padded cell at Watson Clinic in Lakeland, Florida. During his 10 day stay, he detoxed from a drinking binge. The country music entertainer managed to stay sober for longer periods of time after seeking treatment in the late 1960’s. Eventually, he returned to drinking and his behavior became more erratic. In 1976, Wynette divorced Jones. Despite their marriage’s end, the two continued to perform together. Jones publicly blamed himself for their divorce and had hoped for a reconciliation. In 1980, they recorded, “Together Again” and had a hit song with “Two Story House”, but never got back together romantically again. After recording “One” in 1990, the two seemed to finally make peace with leading separate lives. Watch Tammy Wynette and George Jones perform “Golden Ring” live below! Tammy Wynette was called the “First Lady of Country Music” at the height of her career. She is best known for her best selling hit single, “Stand By Your Man”. She married her first husband, Euple Byrd, at just 17 years old. Together they had three daughters, but the marriage didn’t last. Tammy left Euple before their third daughter, Tina, was born. The baby was born prematurely and suffered from spinal meningitis early in her life. To pay her daughter’s mounting medical bills, Tammy worked as a beautician by day and a performer by night. In 1965, Wynette sang on the “Country Boy Eddie Show” on WBRC-TV in Birmingham, Alabama. Following, she began performing with Porter Wagoner. In 1966, she and her three daughter moved to Nashville, Tennessee. Finding a job with a recording company didn’t come easy. Finally, she auditioned for Billy Sherrill and he signed her to Epic Records in 1966. It was during this time she changed her name from Virginia Wynette Pugh to Tammy Wynette. Her first single was “Apartment No. 9” written by Bobby Austin and Johnny Paycheck. Two of her most well known hits were “D-I-V-O-R-C-E” and “Stand By Your Man”. In 1969, Wynette won the Grammy for Best Female Country Vocal Performance for “Stand By Your Man”. Later, Wynette was plagued with health problems. It has been reported, she had well over 15 major surgeries. It’s because of her medical issues that she is said to have developed an addiction to pain medication. In 1986, she received treatment at the Betty Ford Center. Wynette continued to perform until her death on April 6, 1998. She died at the age of 55. George Glenn Jones was born on September 12, 1931 in Saratoga, Texas. George left home at 16 years old, moving to Jasper, Texas to began a career in music. He began singing on the KTXJ radio station. Later, Jones recorded his first record on January 19, 1954 in the living room of Starday Record’s co-founder Jack Starnes. It was during his time in radio that a DJ on station KTRM in Beaumont, Texas gave him the nickname Possum Jones. Jones acquired other nicknames throughout his career some self-proclaimed, others as a result of his lifestyle. There’s no doubt Jones lead a troublesome life battling alcoholism and drug use. He reportedly hit rock bottom in the late 1970’s spiraling out of control. At the time he became homeless and flat broke. With his health in decline suffering the effects of alcoholism, he again sought treatment checking into Hillcrest Psychiatric Hospital in Birmingham, Alabama. Not only did Jones’ health suffer, his career suffered too. By 1980, he had only one hit in a 6 year span. Amazingly, in the spring of 1980 his released “He Stopped Loving Her Today” which became a number one hit. The song written by Bobby Braddock and Curly Putman helped breath new life into Jones’ declining career and in many ways mirrors Jones’ relationship with his ex-wife Tammy Wynette. In 1983, Jones married his fourth wife Nancy Sepulvado and credited her with helping him to clean up his life. Sepulvado managed his finances, his career, and helped him to keep his addictions in check. With his career back on track, Jones continued to create great country music winning a Grammy for Best Male Country Vocal Performance for his song “Choices”. Jones toured, continued to record music, and hosted a television show during the 1990’s. Occasionally he suffered set backs and returned to old habits, but with support from his wife and fellow country artists he managed to get the help he needed. On April 6, 2013, Jones performed his final concert at the Knoxville Civic Coliseum. Jones died on April 16, 2013 at the age of 81 after repeated hospitalizations for upper respiratory infections. George Jones and Tammy Wynette will always be remembered for their impact on country music— together and separately. They have received many honors and awards few country artist will ever achieve. Honors such as Wynette’s 1998 induction into the Country Music Hall of Fame, and the 2011 decision by the U.S. Library of Congress to preserve her original 1968 recording “Stand By Your Man”. Jones became a recipient of the Kennedy Center Honor in 2008 and in 2012 he received the Grammy Lifetime Achievement Award. He was also inducted into the Country Music Hall of Fame in 1992. Through these remarkable achievements their legacy will live on as a significant part of country music history. Be sure to share this look back with other country music fans!